Roseau, Dominica – August 12, 2009….. In delivering the feature address at the Media Launch of the 13th Annual World Creole Music Festival at the Fort Young Hotel on Tuesday evening, Minister for Tourism, Hon. Ian Douglas underscored the real significance of the World Creole Music Festival to Dominica. “The WCMF is not just a festival for us in Dominica…. It is a meeting point; an event of significant cultural and tourism value; it is our way of showcasing the unique Creole heritage and culture of the millions of people of the Creole world… in the music, the cuisine, the language and the various strands of this cultural diversity which is best mirrored at the more than one month of exciting activities during the month of October. The 13th edition of Dominica’s Annual World Creole Music Festival is expected to match and possibly even surpass the dizzy heights reached in previous years judging from the artistes selected to perform at the October 30th to November 1st 2009 event. Saturday, November 1st: Dlux Band; Icons of Zouk; Sweet Mickey; Morgan Heritage; Triple Kay International and Caribbean Vibes. Sunday, November 2nd : WCK; Cadence Icons; Maxi Priest; Michele Henderson; Roy Cape All Stars and Nature Boys. Addresses at the Media Launch also came from Chairman of the Discover Dominica Authority, Mr. Benoit Bardouille, Chairman of the Dominica Festivals Committee and Director of Tourism, Mr. Colin Piper and Events Director of the DFC, Mr. Valentine Cuffy. Remarks were also delivered by Ms. Nathalie Walsh, Marketing Manager of Digicel as well as associate sponsors. The Government of Dominica makes a substantial contribution every year both in cash and in kind to ensure the continued success of the World Creole Music Festival. 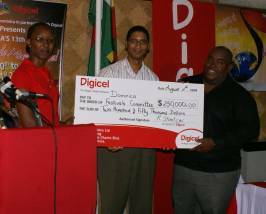 Digicel is again the headline sponsor for this year’s festival. The World Creole Music Festival was created in 1997 as a means of boosting tourist arrivals to the island during the important independence celebrations and to increase revenue from stay-over visitors coming to the island for the celebrations. The festival was conceived out of the need to provide a platform for Dominican musicians and musical expressions as well as to expose the island’s culture to a more diversified world audience. It was also meant to build solidarity and collaboration between Dominican artistes, music producers and intellectuals and others in the creole speaking countries of Guadeloupe, Martinique and St; Lucia as well as from Francophone Africa, Louisiana, Haiti, Seychelles and other parts of the world.